Pretty much finished 'PiAndMash' - that's what I'm calling it. Got the HLT being controlled by a PID class. That's a science in itself! PID tuning who knew. Using Pigpiod to control the GPIOs on the Raspberry Pi - saved me having to run my code as root. 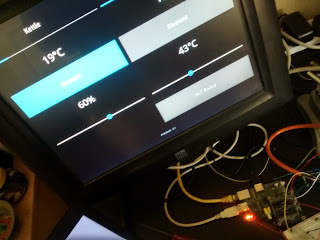 The developer was very helpful - My DS18b20 sensors kept dropping out using his daemon - wasn't his fault at all - turned out that Kivy was using more 40% cpu - which prevented other threads, and the sensor driver, getting enough time on the CPU. I dropped the Kivy framerate to 30fps, and it fixed it - don't need 60fps for brewing software! ...then launched Kivy from .bashrc works like a charm.